On September 1, 2007, the newly constructed Sher Shah Bridge in Karachi, Pakistan, collapsed killing 14 people, and injuring many, including three police constables. The bridge was inaugurated by former President Pervez Musharraf less than a month before it fell down. Shoddy construction and corruption are suspected but the investigation has produced no results yet. Official cover-up appears to have succeeded. In 2003, S.K. Dubey, Deputy General Manager of National Highways Authority of India (NHAI), was assassinated by unidentified gunmen after he wrote to the Prime Minister of India highlighting several instances of "loot of public money" and "poor implementation". He requested anonymity but, tragically, the confidentiality of Dubey’s letter and the identity of the ‘whistle blower’ were both violated as Dubey’s letter was passed down from file to file through the bureaucratic maze. Earthquakes that hit China and Pakistan in the last few years have caused massive destruction. The fact that the damage was significantly disproportionate to government schools and other government buildings has raised questions about shoddy construction by government contractors supervised by corrupt officials. Majority of the victims in both nations were children. As the need for infrastructure projects grows in both the developing and the developed nations and they commit massive funds to such projects, there is a huge concern about the waste from rampant corruption in the global construction industry. Transparency International, a nongovernmental organization that tracks corruption, reports that the construction industry is the most corrupt in the world. A wave of government bailouts around the world and a sharp deterioration in existing infrastructure could lead to as much as $35 trillion in public works spending over the next 20 years, according to a new study by CIBC World Markets. * North America will spend $180 billion on infrastructure each year. * Europe will spend $205 billion. * Asia will spend $400 billion. * And $10 billion will be invested in Africa annually. Stimulus plans will figure heavily into the global infrastructure boom. Indian Planning Commission's deputy chairman, Montek Singh Ahluwalia, recently told Reuters that his nation should be able to maintain economic growth of around 6.5-7 percent in the 2009/10 fiscal year but needs to ramp up infrastructure spending to boost growth. While the recent US prosecution of Halliburton on corruption charges in Nigeria that resulted in a $559m settlement is welcome news, it also raises a lot of questions about how widespread and deeply rooted the corruption is in the construction industry. As a response to the deep concerns, the industry set up a Partnering Against Corruption Initiative (PACI) a few years ago. But Fluor CEO Alan Boeckmann recently told Fortune Magazine, "PACI was a cooperative effort to share best practices. But it had no teeth. We wanted to give it substance." Plenty of companies had signed on, but few had adequate programs to teach and enforce anticorruption principles. Much of that changed four years ago, when he appointed a company lawyer, Wendy Hallgren, as the head of compliance, according to Fortune. Hallgren wanted to observe firsthand what Fluor's employees were experiencing. So she spent much of a year and a half crisscrossing the globe, talking to project managers and engineers in countries including the Philippines, Russia, and Chile. In a Southeast Asian country (not named), Hallgren learned that local officials were demanding that Fluor hire their security details; when the company refused, the government converted the dirt road leading to Fluor's mining project into a one-way path and arrested workers as they drove home. Rather than pay up, Fluor appealed to the regional government - and then later used the story to train employees to react in the same way. * It damages the developed and developing world, resulting in projects which are unnecessary, unreliable, dangerous, and over-priced. This can lead to loss of life, poverty, economic damage and underdevelopment. * It damages companies, resulting in tendering uncertainty, wasted tender expenses, increased project costs, economic damage, reduced project opportunities, extortion and blackmail, criminal prosecutions, fines, blacklisting, and reputational risk. * It damages individuals, resulting in reduced morale, criminal prosecution, fines and imprisonment. connection is called “Kunda”. This is pretty obvious and could be detected easily. In order for the area inspector of electricity department to turn a blind eye a bribe is paid through a middleman or agent. * Storage of material at site: The storing of materials on site or by the roadside causes an obstruction to traffic so it is often necessary to bribe the traffic police or city government inspector. * Tenders are called for on the basis of Detail Project Reports (DPR) by design consultants which are are badly prepared and are unreliable. * Process of procurement ‘‘completely manipulated and hijacked’’ by the big contractors ; forged documents are submitted to justify technical and financial capabilities. * NHAI officials are in league with big contractors and internal NHAI decisions are leaked. *Nearly 10% of contract value is paid as ‘Mobilization Advance’ to selected contractors within a few weeks of award of work, for which the NHAI officials receive illegal gratification or “commissions”. No follow-up to ensure the actual utilization of such advances. *Practice of subletting of contracts or sub-contracting to small petty unqualified contractors fails to ensure the requisite quality of construction. Transparency International (TI) believes that corruption on construction projects can only be eliminated if all participants in construction projects co-operate in the development and implementation of effective anti-corruption actions which address both the supply and demand sides of corruption. These participants include governments, funders, project owners, contractors, consultants, and suppliers, and the business and professional associations which represent these parties. 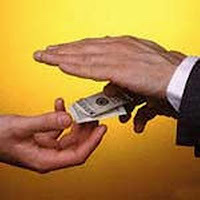 TI offers a number of ideas on fighting corruption in the construction industry on its website. The Sher Shah Bridge did not collapse on account of corruption, but due poor engineering design from a Greek consultant. Pakistani engineers' lack of courage to question a European's judgment played too. As you already know, incompetence is another name for corruption. Secondly, it is not wise to read too much in the $180 billion in annual expenditure on construction that your article alludes to. Just the "restripping" cost of a California highway "lane-mile" is between $2 to $5 million. At median cost, $180 billion is only enough for 52,000 lane-miles. American metropolitan areas have 613 lane-miles per 1000 inhabitants (1999 data), or for the Bay Area alone (7 million people), there are 4,291,000 lane-miles of roadways. Does that define the term "piss in the ocean" or what? If the Sher Shah bridge collapsed due to an error on the part of a "Greek Consultant", why wasn't this consultant held liable for the death of 14 innocent Pakistanis? Why was this whole issue swept under the carpet? The government of the Indian capital, Delhi, has been paying salaries to 22,853 civic workers who do not exist. Salaries for the missing Municipal Corporation of Delhi workers add up to nearly $43m a year, City Mayor Kanwar Sain said in a statement. The "gap" was discovered after the authorities introduced a biometric system of recording attendance. Correspondents say it shows some civic officials created a list of "ghost workers" to siphon off state funds. The Municipal Corporation of Delhi (MCD) employs more than 100,000 cleaners, gardeners, teachers and other workers. City officials became aware there were thousands of "ghost workers" after introducing the biometric system in August last year. Mr Sain said the civic agency has 104,241 "genuine" employees - while the records show the numbers at 127,094. A press release issued by Mayor Sain's office said: "There is a gap of 22,853 employees in the Municipal Corporation of Delhi between the data given by drawing and disbursing officers, the head of the department and the number of employees enrolled for biometric attendance." An "in-depth vigilance inquiry will be conducted into the matter to ascertain the facts," he said. "Strict disciplinary action will be taken against officials who cooked the books," the mayor said. It was long suspected that the city was being defrauded by "ghost workers", but the authorities had always denied the charge. It is a fact that the problem of corruption in India has assumed enormous and embarrassing proportions in recent years, although it has been with us for decades. An article in a French newspaper titled “Playing the Game, Indian Style” wrote: “Investigations into the shadowy financial deals of the Indian cricket league have revealed a web of transactions across tax havens like Switzerland, the Virgin Islands, Mauritius and Cyprus.” In the same article, the name of one Hassan Ali of Pune is mentioned as operating with his wife a one-billion-dollar illegal Swiss account with “sanction of the Indian regime”. A third story narrated in the damaging article is that of the former chief minister of Jharkhand, Madhu Koda, who was reported to have funds in various tax havens that were partly used to buy mines in Liberia. “Unfortunately, the Indian public do not know the status of that enquiry,” the article concluded. This seems true. In the European mind, caricature of a typical Indian encompasses qualities of falsification, telling lies, being fraudulent, dishonest, corrupt, arrogant, boastful, speaking loudly and bothering others in public places or, while travelling, swindling when the slightest of opportunity arises and spreading rumours about others. The list is truly incessant. My father, who is 81 years old, is utterly frustrated, shocked and disgruntled with whatever is happening and said in a recent discussion that our country's motto should truly be Asatyameva Jayete. Europeans believe that Indian leaders in politics and business are so blissfully blinded by the new, sometimes ill-gotten, wealth and deceit that they are living in defiance, insolence and denial to comprehend that the day will come, sooner than later, when the have-nots would hit the streets. The rot in the legislature was again on display recently when opposition MPs offloaded bundles of currency notes in the Lok Sabha, alleging that the money had come from Dr Singh’s party to enable him to win a vote on his nuclear tie-ups with the United States. His Left Front allies tried to block the vote and so they were eased out in the second UPA government.If the lure of lucre could corrupt ordinary MPs we can only imagine the devastating consequences it would have for the executive. There was a time when Indian ministers were cited as examples of probity. With committed activist-politicians like Feroze Gandhi keeping vigil, scams were unearthed promptly and punishments meted out instantly. Nehru’s cabinet minister Rao Shiv Bahadur Singh was jailed as early as in 1949 for accepting a mere 25,000 rupees for forging a mining document. In 1958, Finance Minister T. T. Krishnamachari resigned for helping place state-owned insurance funds with a private banker. The businessman, Haridas Mundra, was jailed. Other tycoons were punished with regularity those days. In 1959, Ramakrishna Dalmia, head of Bharat Insurance Company, was jailed for two years for misappropriating 22 million rupees from the company. Businessman Dharam Teja siphoned 220 million rupees for a spurious shipping company. He was arrested in Europe and jailed for six years. The father of the current chief minister of Orissa was forced to resign for favouring his own company in awarding a government contract. That was the system which today is denounced variously as populist, socialist and inefficient. Today the honest Dr Singh can’t get rid of a telecommunications minister who is widely accused of large-scale corruption, because if he did his government would fall. From Harshad Mehta to Satyam, the journey of Indian financial sandals has dotted the reforms agenda. The defence deals scandal of the Vajpayee government is not entirely unconnected to the lure of lucre. A former socialist, the then defence minister had to resign though all too briefly. He signalled a new brazenness in blunting public outcry by shooting the messenger. Tehelka.com was shut down for exposing the defence deals and its journalists hounded by various agencies. However, the free-market genie was to get even with the prying eyes of the media. It simply co-opted the main players. Thus we recently saw the income tax department naming two of India’s most popular TV anchors — a man and a woman — for involvement as lobbyists for a tainted minister. That rules governing conflict of interest were bent to allow newly set up as well as older media houses to perform their sleight of hand is by now axiomatic. One day the hub of India’s free-market architecture — the Securities and Exchange Board of India (SEBI) — realised that its business was getting mired by spurious reporting. The beneficiaries of all that (post WWII) spending were the so-called zenekon, large construction companies such as Kajima, Shimizu, Obayashi, and Taisei. The strength of the zenekon ensures that Japan is ready to rebuild quickly in the wake of its latest—and still unfolding—catastrophe, just as it did after the 1995 Kobe earthquake. But the sector, while a point of pride catered to by the nation's elected leaders and bureaucrats, isn't always a force for good. Proof lies all over Japan—in mammoth tunnels and bridges to nowhere, dams built against the advice of engineers, and seawalls raised over the objections of those they were purported to protect. The ruling Democratic Party of Japan came to power in 2009 promising an end to wasteful public works projects and the cozy relationships between zenekon and politicians. The rebuilding of northeastern Japan following the Mar. 11 earthquake and the resulting tsunami and nuclear crisis will test that commitment. "They're going to have to contract out these projects in quick order, and that means companies with really tight ties to the contracting agency get the project," says Brian Woodall, a political scientist at Georgia Tech and author of Japan Under Construction. "It may be an opportunity for interested and powerful politicians to get involved, and that to me is not a good thing." The zenekon have traditionally been Japan's political kingmakers. From the 1970s until the 1990s, the companies donated generously to Liberal Democratic Party candidates, supporting the party's half-century reign. In a 1992 case that exposed the role the yakuza crime syndicates played in Japan's trucking and construction industries, testimony revealed that the nation's biggest firms had each donated some 20 million yen a year to a single LDP politician. In his book, Woodall describes a construction minister from the 1960s, Kono Ichiro, who would only meet with executives at his home after they paid a kutsunugidai ("shoe removal fee"), a zabutondai ("floor cushion fee"), and a nantokadai ("something-or-other fee"). In return, Japanese administrators and legislators steered public-works contracts to favored companies. And legislators did their best to grow the pot of money set aside for public works projects, especially in their home districts. The result of all that cronyism and graft: projects like the Joetsu Shinkansen railway, a high-speed line built in the 1970s at the behest of former prime minister Kakuei Tanaka through one of the least populated areas in the country; the Isahaya Bay Project, a controversial series of dikes built by Kajima, Obayashi, and others, to turn a bay into farmland; and the Tokyo Aqua-Line, a nine-mile bridge-tunnel spanning Tokyo Bay, built at a cost of $12 billion by Kajima, and today only lightly used. Prosecutors have periodically taken on the big firms, most recently in 2007, when the government won convictions against nearly all the zenekon—Obayashi CEO Takeo Obayashi, a descendant of the company's founder, resigned over the investigation, and the nation's farm minister, Toshikatsu Matsuoka, hanged himself. The Democratic Party of Japan's 2009 decision to freeze construction on an immense dam in Naganohara was seen as an attempt to follow through on its reformist campaign rhetoric. Why is America Losing in Afghanistan? Imran Khan To Obama: Leave Afghanistan!